All The Pretty Dresses: Queenie's Knickers!!!! 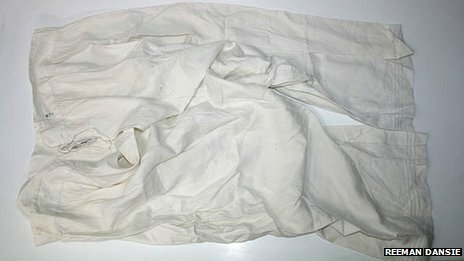 A pair of Queen Victoria's 38in (97cm) linen bloomers have been sold in an auction of royal memorabilia in Essex. The item, among 150 lots which were on sale in Colchester, was sold to a collector from Braintree for £360. 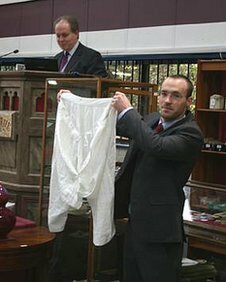 James Grinter, from Reeman Dansie auctioneers, said people liked to collect clothing and "you can't get more personal than royal pants". He added: "We commented that Queen Victoria would not have been amused - they were enormous and very rare." Bids in the royal auction were made from around the world. The most expensive item sold was a 15.5cm (6in) gilded presentation carriage clock, engraved with the inscription "Presented by HRH The Princess of Wales". It fetched £4,900. Queen Victoria's underwear and a piece of the Duke and Duchess of Cambridge's wedding cake are among items of Royal memorabilia to be auctioned in Essex. The items feature in 150 lots to be sold in Colchester on Tuesday. Auctioneer James Grinter said a "rare" silver apple commissioned by Princess Diana "had caused a lot of interest". Given as a gift to her dresser Fay Appleby, to mark their first visit to New York in 1989, auctioneers Reeman Dansie expect it to sell for £3,000. Mr Grinter said: "People just like to own something that has been touched by the Royal Family. These items are very difficult to come by, but we are lucky enough to handle a lot of it." Auctioneers Reeman Dansie have sold items of Royal memorabilia since 2008 after handling the collection of the Queen Mother's butler William Tallon. Mr Grinter said items linked to Princess Diana remained popular but it was "the more personal objects" belonging to the Queen that excited collectors. The auction includes a programme from the 1944 Royal Pantomime Old Mother Red Riding Boots. Written by and starring The Queen, then Princess Elizabeth, and Princess Margaret, the production was performed to their parents at Windsor Castle. Signed in blue ink by the cast, including princesses Elizabeth, Margaret and their nanny Crawford, it is estimated to sell between £500 and £700. Prince William and the Duchess of Cambridge's wedding cake is in a presentation tin, valued at £200 to £300. The auction of 150 lots is expected to raise between £70,000 and £80,000. In all seriousness, Queen Victoria is known for having gone from model thin to ample porportions. That would put these bloomers, given the 38 in waist, somewhere in the middle to late in her reign. That's neat! Thanks for sharing the links to the articles, as well. I found them all really fascinating. I'd love to be able to see that exhibition, "Victoria Revealed," but alas, I'm not at all likely to make it to England soon!